Picture courtesy Transnet Heritage Foundation. 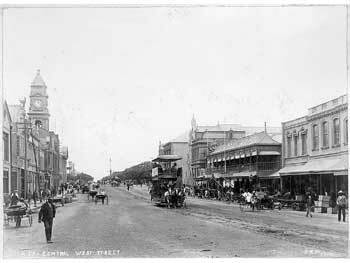 West Street - date unknown. <== Click the picture to download a wallpaper-sized enlargement. (1024x768Px). This wonderful picture of West Street was sent to me by Transnet Heritage Foundation Librarian Eurika Deminey. It clearly shows horse-drawn trams and rickshas in use. The picture is marked J.E.M. Photo and is undated but was probably taken between 1893, when rickshas were introduced, and the arrival of electric trams in 1902. An interesting feature of the picture is the clock tower of what was then the Town Hall [now the Central Post Office] and the bushy area across the road from it. The area was the market square and is where the City Hall now stands. There are now quite a number of contributions from readers on this site and I've now put up a special contents page here for them. My mission to discover more Facts About Durban has led to more than a few surprises along the way. One of them was when I found out that there is an Italian Military Cemetery in Durban at Hillary. In the cemetery are the graves of Italian Prisoners of War, who died while in captivity in South Africa during WWII, and the 120 Italian victims of the Nova Scotia disaster who washed ashore on Durban's beaches. I'm indebted to Claudia Arriati of the Italian Consulate in Durban for details on the cemetery. The Nova Scotia victims were buried in 1942 at the site in three common graves which were marked by three crosses. 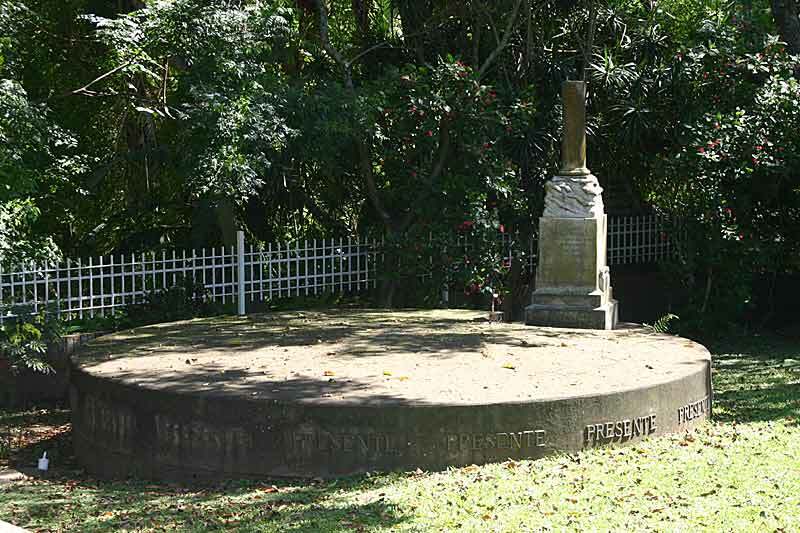 A round tomb was erected in 1982 following a donation from survivors of the sinking who were still living in Mocambique. The tomb is surmounted by a broken marble column, or stele, rising out of the waves and carrying an inscription in Italian and English. It reads: "To the memory of the Sons of Italy who were overcome by the ocean in the sinking of the S/S 'Nova Scotia' XXVIII-XI-MCMXLII. The survivors sheltered in Mocambique". 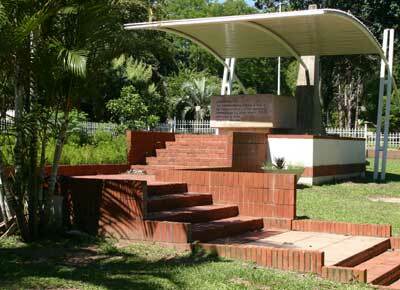 Left: The Altar in the Italian Military Cemetery at Hillary in Durban. Above: The tomb of the victims of the sinking of the Nova Scotia. Click picture for an enlargement. Thirteen Italian POWs were buried at the site in Hillary Cemetery during the war and, in 1956, the Italian Consulate in Durban arranged the exhumation of the remains of other POWS, from a number of other locations, and for their reburial at Hillary. The remains of 16 were transferred from Pietermaritzburg, one from Port Shepstone, three from Weza Forest and one from Aliwal North. An annual mass of remembrance is celebrated at the cemetery in November. A large number of Italians were captured during WWII and many of them were brought to South Africa as POWs. The authorities did not have the facilities to hold them in proper POW camps and they were allowed a good deal of freedom. Many worked on farms in the region, including a number on my Grandfather Bert Salmon's farm in East Griqualand. The only stipulation was that they had to report to the authorities in Pietermaritzburg once a year and my mother remembers escorting a number of them there on the train on her way to boarding school. My informant Leon Nicholson grew up in Durban during WWII and told me he remembers Italian prisoners, particularly officers in their finery, wandering freely around Durban, having promised not to try and escape. It has been quite a time since I added to the diary so it's appropriate that the posting today is a big one. It is in the form of a major article by reader Leon Nicholson about his experiences growing up in Durban during WWII. Click here to go to the page where I post contributions from readers. I'm sure you'll enjoy the story and then, I hope, you'll sit right down and set down your own memories and interesting stories about Durban. And send them in together with any pictures you might have to address on the Contact page or to my e-mail address. Watch this space over the weekend for some exciting news !!! The weekend went by with no sign from the printer but, last Thursday, after a very stressful two weeks, I took delivery of the first five hundred copies of the second edition of Facts About Durban. At one hundred pages long and clothed in its new colour cover, it looked great, even if I say so myself. I immediately set out to deliver the orders I had received, and had dropped off nearly 450 copies, when I discovered that the un-corrected proof of the book had been printed instead of the corrected one. Still, on a more cheerful note, I have posted the second part of Gerald Buttigieg's memories of growing up in Durban in the 1950s. This time, he remembers going fishing with his uncle. It's here!!! 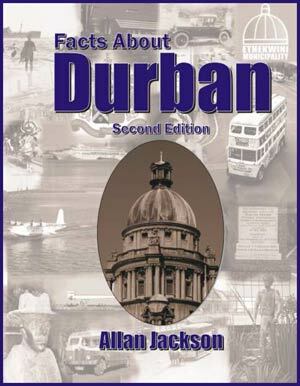 The Second Edition of Facts About Durban is here at last. It's almost twice as long as the first and more than five times as interesting. Facts About Durban, Second Edition, had a very nice mention in the Sunday Tribune today. Reporter Howard Donaldson called it a fascinating book and, I must say, I have to agree. Click on the image below to read the article. No way, Jose! The spokesman quoted in the article says that the organisation had not considered celebrating its anniversary because it wants to dissassociate itself from the old City Police and its colonial past. This only served to confirm the very strong feeling I have been getting that, as far far as most of our officials are concerned, Durban appeared out of nowhere just before the first democratic elections in 1994. I really feel that it is wrong to try and blot out bits of history that you don't like and that it is as wrong now as it was when the National Party were doing it during the apartheid era. Got a very nice mention from Jon Penn in today's Idler's column in the Natal Mercury. He set his readers a mini-quiz on Durban using bits taken from the book and confessed that he'd only have scored 2 out of seven without his copy of it. Thanks John!! I would have put up a picture of the article, as usual, but I'm starting to run out of server space and I'll only be putting up essentials until I have the problem sorted out.